It all started on Valentine’s Day when Zari Hassan showed off a bouquet of flowers from her lover who for some reason she will not reveal just yet. But progressively, the mother of five has been revealing who Diamond Platnumz’ replacer is. 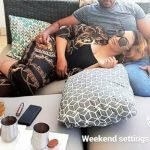 The Ugandan socialite and businesswoman has been posting now and then about her new man who goes by the name King Bae. She recently took to social media to share a deep message she sent received from him after making him a delicious meal. “You gave me a glimpse of the rest of my life as it should be. You are a script that needs no editing. You are everything I admired in different people compacted into one. You are a person I am willing to entirely surrender unto in my entirety with zero reservations and no hidden agenda. You have a beautiful character, personality, enthusiasm, charisma, presence and appearance. “You are the answer to my biggest prayer, I am fully devoted to you with no doubt whatsoever.I admire your entire family as well. I love you,” read part of a sweet message KingBae sent. Hidden It’s been almost an year off being single for Zari since she broke up with Diamond Platnumz in 2018. Zari also told fans the reason why she’s hiding Kingbae’s face is because he’s only her’s and not for social media. The post One man’s trash…Zari’s new boyfriend pens down emotional letter confessing how he loves the mother of five appeared first on Ghafla! Kenya.